Sophie’s Choice was one of the films on the AFI list I wasn’t overly excited about seeing again. To begin with, I’d seen it. But I also have a hard time watching Holocaust-related films because when you grow up Jewish you pretty much have to see it all — from Hollywood films to documentaries to short films about butterflies (my MOT friends who went to Hebrew School will get this reference). But then I started watching Sophie’s Choice yesterday and I was immediately drawn in to this amazing film. All discussion of Sophie’s Choice must begin and end with Meryl Streep. Say what you want about Streep, but it’s no accident she has been nominated for 16 Academy Awards. She won her second “Best Actress” award for her role as Sophie, and frankly I’m not sure how an actress can perform any better. I didn’t think for one second that she wasn’t a Polish immigrant in this film…she was astonishing. Sophie’s Choice is an actor’s film, by which I mean the three leading roles carry the action throughout and the film is entirely dependent on those performances. 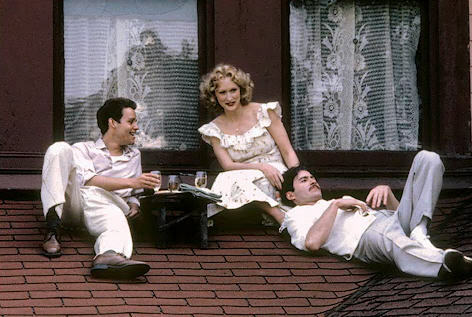 I suspect Streep knew what she was getting into when Alan Pakula cast her, but lost in Streep’s magnificence were two wonderful performances by Kevin Kline and Peter MacNicol. Sophie’s Choice marked the feature film debut for Kline and his work as Sophie’s “mad lover” Nathan was very memorable and clearly indicative of things to come for this Oscar winner. And then there was Peter MacNicol in only his second film, playing “narrator” Stingo. MacNicol never did turn into a great film star, but he has won a handful of Emmy Awards for great performances in a whole host of TV shows from Ally McBeal to 24 and Grey’s Anatomy. This acting ensemble was fabulous and it’s quite remarkable that the film didn’t even get nominated for a Best Picture Oscar. That year’s Academy Award for Best Picture went to Ghandi, which was a great film but did not even make the AFI Top 100. Also nominated that year were two films that did make the AFI list (Tootsie and E.T.) along with The Missing and The Verdict. Sophie’s Choice certainly deserved to be nominated…it did get nominated for the Golden Globe. Sophie’s Choice is definitely worth seeing again if you haven’t seen it in a while. Most people know it because of the horrific “choice” itself that Sophie had to make at her arrival at Auschwitz, but it’s so much more than that. It is funny at times, and heartwarming, but ultimately it’s a tale of man’s inhumanity to man and how difficult “recovery” can be. It’s also a commentary on madness (the Nazi kind and the kind that afflicts everyday people like Nathan). I was glued to the screen this time around and really, really loved Sophie’s Choice.